The Strive Board of Directors is currently recruiting for an Office Administrator. We are looking for an individual who is highly organized, a skilled communicator, well versed in using office administrative computer systems and tools and enjoys providing outstanding customer service in a fast-paced environment to join our Strive team. As a part-time employee of Strive, the successful candidate will report directly to the Board of Directors along with the Artistic Director. The Office Administrator is repsponsible for providing administrative support to our Board and Teachers, acting as a liaison to our Members (Dancers and Families,) assisting in Member account support through our Jackrabbit registration system and providing communication support across our Strive Membership and the public. On Sunday March 31, 2019 our Dancers hit the stage for our Second Annual Solo Showcase. Featuring selected pieces from our Dancer's Extra Work, including their Solos and Duets, this will be the first show of our 10th Season. Don’t miss it. Tickets go on sale March 4, 2019. This year, we're celebrating our Ten Year Anniversary; and we're all so excited! We have seen so much growth and change in the past ten years, we can't believe it. So many memories. Join us for what is sure to be our biggest year yet, in Season 10! Don't Miss this exciting Summer Intensive on August 8th & 9th. This intensive will be run by our own Strive Graduate Miss Carleen Zouboules, who is currently going into her third year of her BFA in Performance Dance Degree at Ryerson University; and Miss Kate Forss, who is currently contracted for her second season with the Radio City Rockettes in New York City. Learn more details about this Summer Intensive here. We all could not believe it. 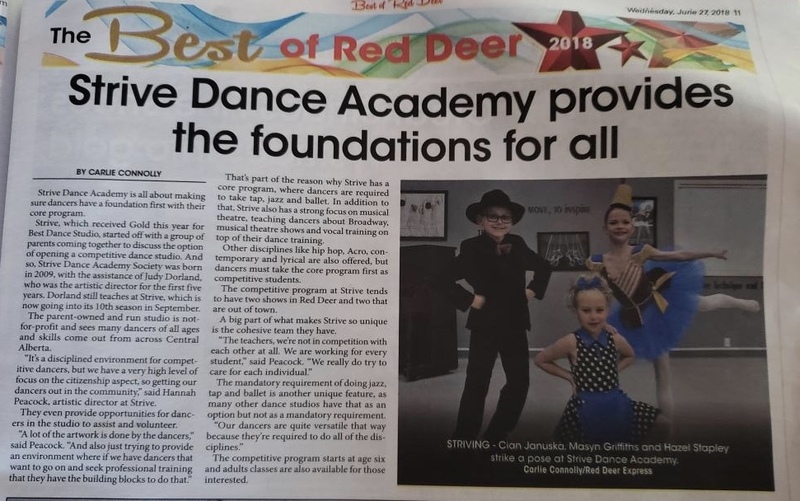 On Wednesday June 27, 2018 the Red Deer Express published their Annual Best of Red Deer Reader's Choice Awards, and Strive Dance Academy was voted Gold by our Community. All of us at Strive, Teachers, Dancers, and Parents, are extremely humbled and flattered! We are all so incredibly proud of our studio; as small as we are we are so happy that we're making such a big impact within our Community! Central Alberta is such an amazing, creative and gifted community; and we're so happy to be a part of it. We owe thanks to so many people, from our many volunteers, to our many supporters in the community; we would not be where we are without all of you. Thank you from the bottom of all of our hearts. Strive Dance Academy is hiring! 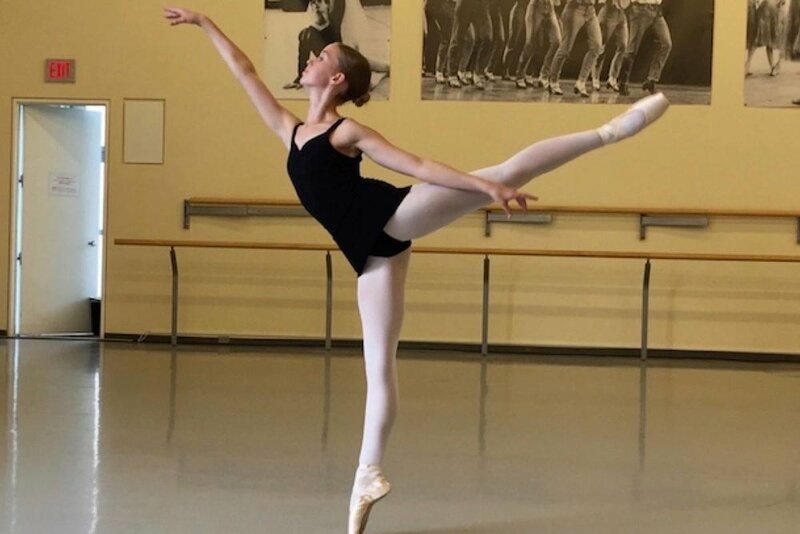 Strive Dance Academy is accepting resumes for an Acrobatic Arts Instructor for the 2018-19 Dance Season. Our students range from 5 -18yrs and classes are on Friday evenings. Additional dance certification is an asset. Candidates must have a strong dance background and be a good team player to join our supportive team environment. Training safely, utilizing age and strength appropriate progressions must be a priority for applicants. Our 1st Ever Solo Showcase! On Saturday April 7, 2018 we held our first ever Solo Showcase, and it was an unbelievable success. Featuring our Dancer's Extra Work, including all of their Solos and Duets, many of these Dancers were hitting the stage for their first ever solo and it was inspiring to watch.